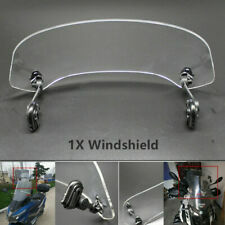 Adjustable windshield, fixed on the above of original windshield suitable for nearly any bike with a windscreen. Universal Fit For Adjustable Screen Windscreen Windshield Spoiler Air Deflector. --Professional modified Acrylic clear windshield provides good-looking while adding an excellent degree of wind protection. Universal Adjustable Smoke Adjustable Clip On Windshield Spoiler For BMW Models. Honda Yamaha Suzuki Kawasaki BMW KTM Aprilia Ducati With windshield models Universal. Adjustable windshield, fixed on the above of original windshield, heightening for better head protection rider safety.This Item is easy to install without instructions. PUIG Fuel Cap Covers Naked. 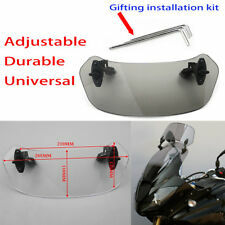 Adjustable windshield, fixed on the above of original windshield suitable for nearly any bike with a windscreen. 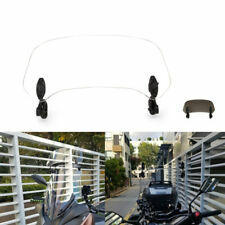 Universal Adjustable Screen Windscreen Windshield Spoiler Air Deflector. Professional modified Acrylic clear windshield provides good-looking while adding an excellent degree of wind protection. For YAMAHA XJ 400 Diversion 1991-1993. For YAMAHA XJ 600S Diversion 1992-2004. For YAMAHA XJR 1200 1994-1998. For YAMAHA XJR 1300 1999-2016. For SUZUKI VX 800 / SV 650 / GS 500E / GSF 600N 1200N. Installing your Windshield. It usually takes about 1-2min to install and no tools are required for mounting, everything can be fitted within a matter of seconds and you can raise and lower the height to whatever suits you best without ever needing to uninstall the windshield, this will make it easy for you to find the most optimal height for your needs. 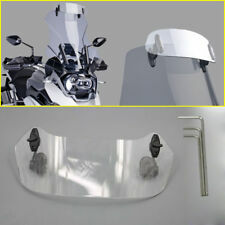 Airflow Adjustable Windscreen Wind Deflector Universal Motorcycle Windshield for Kawasaki BMW Ducati honda KTM. Adjustable motorcycle windshield, fixed on the top of original windshield. heightening for better head protection for riders. Thread: M5x0.8mm. 10mm length 14mm. These 5mm (M5) universal rubber well nuts fit most windscreens, body, & other motorcycle and ATV applications. Material: High Quality Rubber with Captive Brass Nut. 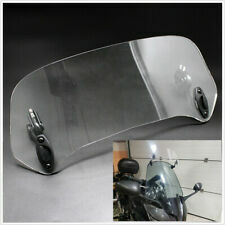 Adjustable Clip On Windshield Extension Spoiler Wind Deflector For Motorcycle. 1 x Windscreen;. Adjustable windshield, fixed on the above of original windshield, heightening for better head protection rider safety.This Item is easy to install without instructions. These 5mm (M5) universal rubber well nuts fit most windscreens, body, & other motorcycle and ATV applications. Material: High Quality Rubber with Captive Brass Nut. 10mm length 14mm. For many Aprilia, MV Agusta, Triumph, Ducati, BMW, Honda, Kawasaki, Suzuki, Yamaha, Polaris, and other Motorcycle & ATV models. Universally Fits Any Motorcycle with M5 Windscreen Bolt Pattern. Windscreen Screws. Motorcycle Cover. Scope: any style of imported motorcycles windshield. Bolt Toppers. Bolt Size : 5mm X 19mm. Motorcycle Goggles. Brake Pads. Radiator Covers. Battery Side Covers. Engine Cover. Brake Clutch Levers. Brake Disc. Rear Seat Cowl. GSX-R 600 / 750. 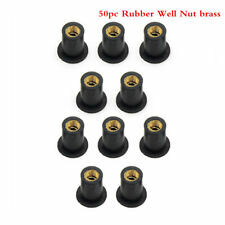 8 x rubber wellnuts. Universally Fits Any Motorcycle with M5 Windscreen Bolt Pattern. Windscreen Screws. Motorcycle Cover. Scope: any style of imported motorcycles windshield. Bolt Toppers. Bolt Size : 5mm X 19mm. 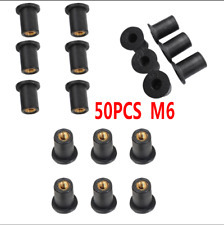 These 5mm (M5) universal rubber well nuts fit most windscreens, body, & other motorcycle and ATV applications. 10mm length 14mm. These are used on many motorcycles & ATVs to fasten plastic fairings, body parts, fenders, and bumpers. Windscreen Spike Bolt Screw For Suzuki Hayabusa GSX1300R GSXR600/750/1000 Katana. 5mm Windscreen Windshield Bolts Screw Set For Honda Yamaha Suzuki Kawasaki BMW. 5mm Windscreen Windshield Bolts Screw Kit For Honda Yamaha Kawasaki Suzuki Blue.